For any new mom, nothing is more worrying than the howls of her baby who cries miserably for periods of time due to colic in the belly. Colic usually causes extended howling. But don’t worry, there is light at the end of the tunnel with quite a few cures for soothing these screams; and one of these cures is the age-old remedy known as gripe water.However, the age-old preparation may still be a stranger to many new parents. What is gripe water for babies? Is it safe? Can it actually cure the colic babies? How to use it? Such questions will be clearly answered in the following article. Gripe water is customarily prepared with herbs like ginger, chamomile, fennel etc. All of these herbs not only soothe and settle down the stomach by lessening the gas, but also assist to calm down the baby. This totally herbal potion is obtainable effortlessly, with slight likelihood of side effects. Moreover, it could be dispensed to the babies without trouble because most preparations are available with small pipettes. Given that the digestive system of the baby is not wholly matured, gas will be built up in their stomachs; and the presence of gas causes the baby to blubber and shed tears due to pain. Fortunately, nearly all gripe waters are flavorless hence most babies do not oppose it. When the gripe water is dispensed to colicky babies, it changes the small teeny gas bubbles into one entire gas bubble which could be belched out easily, thereby relieving the baby. Is it Safe to Use Gripe Water for Babies? 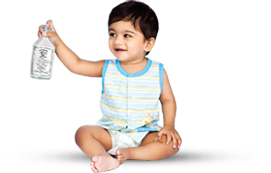 Gripe water is not approved for recently born infants younger than one month because they have a very touchy digestive system which is not developed adequately thus can get filled by the constituents of the gripe water and may make the constituents futile. Moreover, the newborn could be easily upset by one or several constituents of gripe water for being sensitive to any ingredients. Even if the allergy is slight, it can spark off a sequence of harmful side effects. It could be anything like skin rashes, acute, rough and heavy troubled breathing. In case any side effects occur, gripe water should be discontinued instantaneously. Always read the components watchfully and keep away from preparations that include sodium bicarbonate for its tendency to disturb the pH value of the baby’s belly. Furthermore, shun those charcoal-contained ones for the likelihood to produce constipation/black stools. The perfectly choice is gripe waters prepared from herbal oils. At all times read the label and the directions carefully. Various brands have different purposes oriented to different groups of babies. Following the instructions will help you comprehend the duration, age limits and other important requirements of gripe water written in the label. Watch out for allergies such as irritation, inflammation of lips and tongue, soggy eyes, difficulty in gulping down or inhalation, loose motions, vomiting etc. Remember the baby may be allergic to any constituents of gripe water. Put the gripe water in a proper place that out of direct sunlight and reach of kids. Soothing noises could calm crying babies down for imitation of sounds in the womb, bringing them back to the accustomed environment and sounds. Babies tend to be relieved by the sound-recording of heartbeat, a white noisy machine, even the droning noises of household equipment. Also, babies like voices of people they prefer. Singing soft lullabies gently when holding your baby is a good alternative, too. Body swinging, gently rising and falling of the head and cot swaying are different periodic actions that comfort the baby’s pain and make them feel better. Babies enjoy a stable and soft thump. If either parent dances, marches and rhythmically claps to the music along with their babies, babies will enjoy a lot. Many times the babies manifest fussy manners as an indication of hypersensitivity to cow’s milk, in such case, switch the formula to a soy substitute will assist to relieve your baby. However, soy formulas should never be given to infants with premature birth. Wrapping your baby in a soft blanket is an antique method to quiet the baby. The soft silky blanket could be used to swathe the whole being of the baby or merely its arms. The fabric of the blanket should be chosen in accordance with the prevalent weather. Tummy pressure can be applied to babies to relive the gas or pain assembled in babies’ stomach.Usually the tummy pressure is applied to the baby after the intake of food. By placing a hand to the baby’s belly, along with kneading to the baby’s back, the baby can be supported to eject the gas in the stomach by burping.